Discover How Easy It Is To Cash In On Thousands Of Tangible Affiliate Products Online Without Ever Having To Worry About Stock, Shipping Or Customer Support! Did you know that promoting digital profits as an affiliate is NOT NECESSARILY the most profitable means of building an affiliate income? Many smart marketers are making a SUBSTANTIAL income promoting physical products. On the other hand, most marketers know that with DIGITALLY delivered products, you need to factor in a certain percentage for refunds (which is usually far higher than you get with physical products) as some people will request a refund no matter HOW good the product actually is… that was their intention from the outset. PLUS they know they won’t even have to return it! This brand new report will show you exactly how to profit from physical products without having the headaches of stock control, shipping, and customer support. Plain and simple – if you’re not generating at least SOME of your affiliate income from the promotion of PHYSICAL products then you’re missing out BIG-TIME. 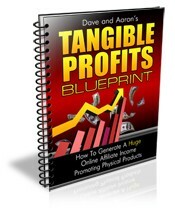 Grab your copy of this step-by-step report and find out how YOU can be selling physical products within hours and be cashing BIGGER affiliate checks.